Editor’s note: Essential Wholesale & Labs believes in implementing sustainable practices wherever possible. This year, we will feature a series of blogs on the topic of corporate sustainability, including industry-wide trends and practices we’re seeing. In today’s blog we’ll take about eco-friendly packaging choices and how important they are to your brand. Choosing your product’s cosmetic packaging is exciting—it’s your opportunity to tell your brand’s story in a visual way and communicate directly with your target customer. Whether this potential customer is shopping online or in a brick and mortar store, your product’s packaging must be compelling–you won’t have much time (or space) to communicate why your product stands out over the others on the shelf. Choosing the perfect packaging for your product is critical in the beauty world, but comes under increased scrutiny in the natural skincare segment of the industry, as customers increasingly expect not only their products but the accompanying packaging, to be eco-friendly and responsibly sourced, as well. After all, your target customer likely cares about the environmental impact of all pieces of their skincare product, from the raw materials used to create the bottle to the box it comes in. Brands that hold sustainability and eco-friendly values must tell their story on the product’s packaging but recyclable symbols and certifications, are only part of the story. Refillable products, noticeably lighter weight components, less outer packaging and even the weight of the label all help support your values. Packaging is the consumer interface so the easiest way to get consumers’ attention in this regard is with the words recycled content and recyclable. Recycled content speaks volumes about being green, says Katherine O’Dea, Senior Fellow with GreenBlue, a nonprofit organization that includes the Sustainable Packaging Coalition. Katherine adds that packages made of recycled materials and those that can be recycled are today’s key trends because consumers understand (or think they understand) these terms. According to a nine-year industry study from Packaging Digest in partnership with the Sustainable Packaging Coalition, the trend toward sustainable packaging grows each year. Many of the same tactics are applied today as before, such as lightweighting, use of renewable materials, increased amount of recycled content and recyclable packaging. In fact, recyclable packaging remains at the top of the list of environmental marketing claims for brand owners based on its importance with their customers. In January of this year, Proctor & Gamble unveiled the first fully recyclable shampoo bottle made from beach plastic. But sustainability is not just for the big companies. Indie beauty businesses that reach both the local and niche markets of shoppers who frequent Trader Joes, and Whole Foods, too. The importance of a more eco-friendly supply chain is most evident with millennial buyers who make shopping sustainably a priority. Grace Farraj, SVP of Public Development & Sustainability from the Nielsen Global Survey of Corporate Social Responsibility and Sustainability notes, “Brands that establish a reputation for environmental stewardship among today’s youngest consumers have an opportunity to not only grow market share but build loyalty among the power-spending Millennials of tomorrow, too.” The Nielsen survey also found that millennials are willing to pay more money for products from companies that demonstrate a commitment to positive social and environmental impact. 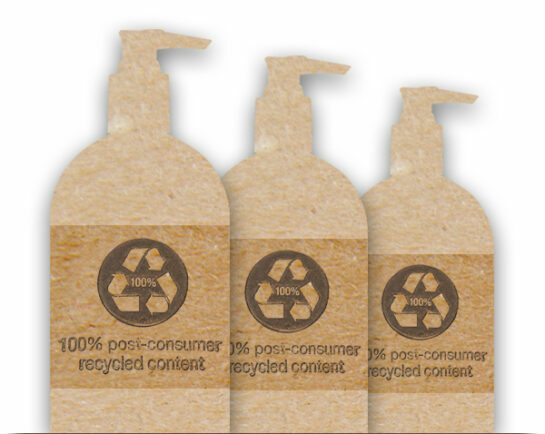 Is your product sold in eco-friendly, post-consumer recycled or sustainably sourced packaging? Will you be making the transition to sustainable packaging? Each company will make their transition differently and we’d love to hear your stories. The Sustainable Packaging Coalition® (SPC) is an industry working group dedicated to a more robust environmental vision for packaging. Through strong member support, an informed and science-based approach, supply chain collaborations and continuous outreach, we endeavor to build packaging systems that encourage economic prosperity and a sustainable flow of materials.The SPC is a project of GreenBlue®, a nonprofit that equips business with the science and resources to make products more sustainable. Neenah Packaging – retail boxes and packaging for cosmetics and perfumes. Globe Guard Products – Stock shipping boxes, mailers, packing papers, tape, etc., with an eco-friendly mission.